Exhibit • Mounting "Speed" show at UMFA is a logistical challenge for handlers of classic cars. Paul Fraughton | Salt Lake Tribune John Carefoot sits inside the Mormon Meteor I as it is lowered to the ground in front of the Utah Museum of Fine Arts in Salt Lake City on Wednesday, May 23, 2012. The car is one of 19 classic cars that will be featured in an upcoming exhibit at the museum. Paul Fraughton | Salt Lake Tribune John Carefoot climbs inside the Mormon Meteor I as it sits inside a transport trailer before being unloaded for an upcoming exhibit at the Utah Museum of Fine Arts. Paul Fraughton | Salt Lake Tribune The Mormon Meteor I, pictured Wednesday, May 23, 2012, in front of the Utah Museum of Fine Arts, is one of 19 classic cars that will be featured in an upcoming exhibit at the Salt Lake City museum. Paul Fraughton | Salt Lake Tribune John Carefoot drives he Mormon Meteor I to the open door of the Utah Museum of Fine Arts in Salt Lake City on Wednesday, May 23, 2012. The car is one of 19 classic cars that will be featured in an upcoming exhibit at the museum. Paul Fraughton | Salt Lake Tribune John Carefoot sits inside the Mormon Meteor I in front of the Utah Museum of Fine Arts in Salt Lake City on Wednesday, May 23, 2012. The car is one of 19 classic cars that will be featured in an upcoming exhibit at the museum. Workers unload artwork from trucks at the Utah Museum of Fine Arts on a regular basis, and people on the surrounding University of Utah campus take little notice. Most of the artwork, though, doesn't weigh 2 tons. 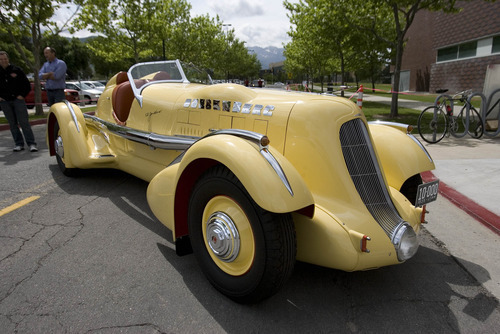 It also doesn't roar like the engine inside the Mormon Meteor I, the 1935 Duesenberg SJ in which Ab Jenkins set early speed records on the Bonneville Salt Flats. 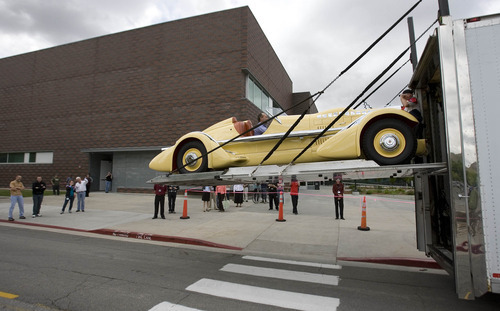 That car and 18 other classic automobiles were unloaded this week at UMFA, where they will make up a new exhibit, "Speed: The Art of the Performance Automobile," on the museum's first floor starting Saturday. 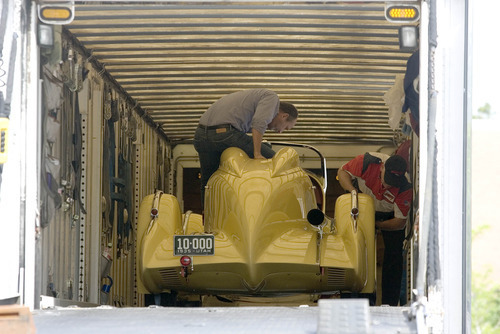 Unloading the Mormon Meteor I drew more than a dozen spectators on Wednesday morning, with people snapping photos on their camera phones of the pale-yellow torpedo with Jenkins' signature and the block-letter "DUESENBERG" name in gleaming chrome. It's not a new idea to put cars in a museum setting, said Ken Gross, guest curator of the exhibit, who notes that the Museum of Modern Art in New York had an automotive display in 1951. Gross and his team handle the cars like fine art, wearing white gloves to keep the vehicles as immaculate as possible. But it's these artworks' bulk that can make the logistics a challenge. The corridors of the Marcia & John Price Building, which UMFA calls home, were just a bit wider than the widest car in the show, "The Beast III," the 1952 streamliner built by Chet Herbert. What's more, "The Beast" has its wheels almost completely enveloped by the car's aerodynamic body, and very few surfaces where someone can place a hand to push. Ultimately, Gross had to get into the driver's seat and steer the massive car himself. To move the Mormon Meteor I, John Carefoot  who curates the private car collection of the Meteor's owner, Ohio banker Harry Yeaggy  discussed with Gross and Webb Farrar, the "automotive exhibition consultant" overseeing the exhibit's staging, about where workers can and cannot push the car. The windshield supports are too delicate to push, while the massive chrome exhaust pipe that runs down the Meteor's right side will be too hot to touch. Carefoot climbed into the driver's seat and revved the engine, sending up a loud roar and a belch of exhaust. He then slowly drove the car toward the museum's double doors, with Farrar guiding him in, pointing left or right to make small adjustments. Once the car crossed the threshold, Carefoot cut off the engine. It would be moved by hand from there. Gross said the Meteor I is to be placed prominently in the exhibit, facing grille-to-grille with the Mormon Meteor III  on which Jenkins set many records in the 1930s at the Bonneville Salt Flats, a dozen of which still stand today. Gross said he was inspired to place the two Meteors facing each other, emblematic of two other famous vehicles in Utah history: the locomotives No. 119 and Jupiter that met at the completion of the Transcontinental Railroad. • The 1957 Jaguar XK-SS once owned by movie star Steve McQueen. • The 1952 So-Cal Speed Shop Belly Tank Lakester, another record-setter at Bonneville. • A 1965 Cobra Daytona Coupe. • A Ferrari 375MM once owned by filmmaker Roberto Rossellini and actress Ingrid Bergman. • A Mercer Raceabout, a racing vehicle made about a century ago. 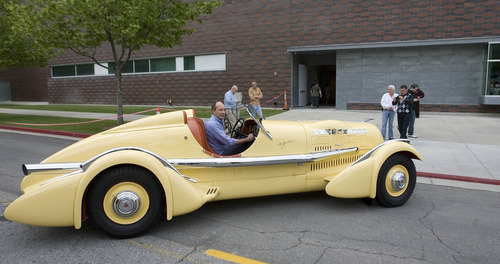 The cars are owned by collectors and museums from around the country. Some are owned by Utah businessman and former ambassador John Price, whose family's foundation is the exhibit's title sponsor. Sometimes persuading a car collector to let his or her prize sit in a museum for a few months takes some doing, Gross said. "Many of them really enjoy using their cars," he said. "When they understand the importance of it, they're willing to make that sacrifice." The exhibit "Speed: The Art of the Performance Automobile" opens on Saturday, June 2, and runs through Sept. 16. Where • Utah Museum of Fine Arts, 410 Campus Center Drive, University of Utah campus, Salt Lake City. Tickets • $18 for adults; $13 for youth (14-17), people over 65, and U. of Utah staff; $9 for U. of Utah students; $3 for children (3-13); free for infants (2 and younger); available at Smith's Tix outlets or at the door. Premiere gala • Thursday, May 31, starting at 7 p.m. Tickets are $150, online at http://www.speedumfa.com.